Bathhouse Row, Quapaw Baths, Hot Springs NP, 1985. Bathhouse Row consists of eight bathhouses along Central Avenue, the main street of Hot Springs, Arkansas. Also included within the district are the Grand Promenade on the hillside behind the bathhouses, the formal entrance and Stevens Balustrade, the fountains that provide the public with a taste of the waters purported at various times to heal every ailment imaginable, and the park's headquarters/visitor center. The bathhouses were constructed along the east edge of Hot Springs Greek, which was covered over and channeled into a masonry arch in 1884. 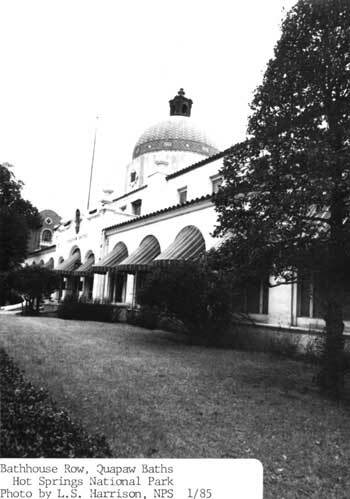 The northernmost bathhouse on the row is the Superior, completed in 1916 and designed by architect Harry C. Schwebke of Hot Springs, Arkansas. The building is simply designed in an eclectic commercial style of classical revival origin. The building has two stories and a basement, is L-shaped in plan and is constructed of brick masonry and reinforced concrete. It contains 23 rooms and more than 10,000 square feet. Principal exterior architectural details are on the front elevation. The three bays are separated by brick pilasters with patterned insets and are decorated with concrete painted in imitation of ornamental tile. Green tile medallions (paterae) are centered over the pilasters in the friezes below the first and second story cornices. The one-story sun porch at the front elevation projects out from the main mass of the two-story building. The first floor contains the sun porch, the lobby flanked by the stairs, and the bathing facilities. The men's bath hall, dressing rooms and pack room are on the north end of the building. The women s smaller facilities are on the south side of the building. The second floor has additional dressing rooms,< a lounge, and massage rooms. Bath stalls are marble-walled with tile floors and solid porcelain tubs. The front desk in the lobby is marble. Stairs are marble and tile. Most of the interior hardware is brass. Walls vary from painted plaster to marble (men's hot room) to tile (bath halls). The double hung wood frame windows have twelve lights over one light. A concrete ramp edged with wrought iron railings provides a central entrance to the structure. A cooling tank and steel frame to support it were added to the rear of the building in 1920. The building was damaged by a flood in 1923, but the extent of repairs is not known. Some remodelling was completed on the interior in the 1930s, but again the extent of those changes is unknown. In 1957, the massage room was extended, wall radiators were installed, floors were re-tiled, and modern lighting fixtures were added. Many of the original furnishings were also replaced at that time. Other changes to the building include the installation of whirlpool equipment in 1962 and air conditioning in 1971. The Superior closed in 1983 and the furnishings were sold at auction. The building was constructed on the site of an earlier Superior bathhouse. The Hale was constructed in 1892-93, replacing an earlier Hale bathhouse. The building is primarily a brick and concrete structure, reinforced with iron and steel. The building underwent extensive renovations in 1919 (design by George Mann and Eugene Stern of Little Rock), and again in the late 1930s (design by Thompson, Sanders, and Ginocchio of Little Rock). The latter renovation changed the facade from neo-Classical revival to Mission Style in 1939-40. The building is generally rectangular in plan, and is two and one half stories in height. The exact design of the 1892 bathhouse is unknown. By 1919, the neo-Classical building had a hierarchy of fenestration typical of that style: rectangular windows on the ground floor with arched windows on the second floor. The 1939 remodelling included changing the rectangular window openings of the sun porch at the front of the structure to arched window openings, like those on the second story. The hip roof was covered with red tile. The classical segmental arch over the main entrance became a simpler Spanish bell gable. The brick was covered with stucco, and wrought iron grilles were placed over the two windows flanking the entrance. The entire effect became very "California." Interior modifications in conjunction with those remodellings are unknown. The first floor contains the sun porch, lobby, office, and the men's dressing room, pack room, cool room, and bathing hail with skylight. The women's side contains similar facilities, but smaller in scale. The second floor, reached by stairs flanking either side of the lobby, has additional dressing spaces, cooling rooms, and massage rooms. The partial basement has employee dressing rooms and a display spring. An unusual engineering feature in the basement is the use of brick vaulting as the form into which concrete was poured for the floor above. The cooling system has changed periodically during the building's periods of operation. The basement underwent repairs following a flood in 1956. The building ceased operation as a bathhouse in 1978 and was closed for several years. In 1981 it was remodelled for use as a theatre and concessionaire operation (snack bar, gift shops, and arcade). A new emergency exit was installed at the south end of the lobby to meet fire code regulations. The concessionaire operation failed and the building closed nine months later. Construction began on the new Maurice Bathhouse in 1911 and was completed by 1912. The building was designed by George Gleim, Jr., of Chicago. The building was remodelled in 1915, following a design by George Mann and Eugene John Stern of Little Rock. The building, generally square in plan, is three stories in height and contains 79 rooms and nearly 30,000 square feet (including basement). The building was designed in an eclectic combination of Renaissance Revival and Mediterranean styles commonly used by architects in California such as Julia Morgan. The brick and concrete load-bearing walls are finished with stucco on the exterior, and inset with decorative colored tiles. The front elevation of the building is symmetrical, with a five bay enclosed sum porch set back between the north and south end wings. Besides the symmetry, the hierarchy of fenestration found in Renaissance Revival buildings is also present: delicate arches of the porch window and door openings on the first floor, paired nine-light windows on the second story, and enormous rectangular openings on the third floor, further illuminated by the skylight above. The predominantly flat roof is finished with built-up roofing material while parapets and some other sections of roof visible from ground level are covered with green tile. The skylights are metal frames with wire glass. On the interior the concrete beams of the beam and slab floor construction are exposed, but have been finished with plaster similar to the interior walls. The first floor contains the sun porch/entrance, lobby, stairs and elevators, men's facilities to the south, and women's facilities to the north. The arches and fluted Ionic pilasters of the lobby re-emphasize the elegance presented by the front elevation. An addition to the lobby space is the orange neon "Maurice" sign on the wall behind the marble counter of the front desk. Neon signs were also found on the interior of the Superior and in other businesses in the immediate vicinity. Stained glass skylights and windows of mythical sea scenes in the men's and women's portions contribute to the sophistication of the building. The second floor contains dressing rooms for both sexes, a billiard room with a mural, and various staff rooms. The third floor houses the dark-panelled Roycroft Den, name after Elbert Hubbard's New York Press that promoted the Arts and Crafts movement in the United States. The den was also known as the "Dutch Den." The den was added during the 1915 remodelling, at the same time that the sun porch was constructed, the roofline changed, and the interior renovated. The den contains an inglenook fireplace with flanking benches. Carved mascarons detail the ends of the ceiling beams. The den replaced an earlier solarium. The gymnasium in the basement was also enlarged. A therapeutic pool was installed in the Maurice in 1931 to treat various forms of paralysis (spurred on by Franklin Delano Roosevelt's treatments at Warm Springs, Georgia). Other interior remodelling work was done in 1930-31, resulting in the gymnasium function being moved to the Roycroft Den. Two concrete ramps that flank the central stairs and provide access to the front of the building were probably added at the same time. Other changes through the years were relatively minor. The Fordyce bathhouse was built in 1914-15, and designed by George Mann and Eugene John Stern of Little Rock, Arkansas. In style, the building is primarily a Renaissance Revival structure, with both Spanish and Italian elements. The building is a three-story structure of brick construction, with a decorative cream-colored brick facing with terra cotta detailing. The foundation and porch are constructed of Batesville limestone. On the upper two stories, the brickwork is patterned in a lozenge design. The first floor exterior of the front elevation to the west is finished with rusticated terra cotta (shaped to look like ashlar stone masonry). The remainder of the first floor is finished with glazed brick. A marquee of stained glass and copper with a parapet of Greek design motifs overhangs the open entrance porch. The north and south end walls have curvilinear parapets of Spanish extraction. These side walls have highly decorative terra cotta windows on the first floor. On the front elevation, the fenestration defines the seven bays of the structure and provides the architectural hierarchy typical of Renaissance Revival style buildings. The windows on the first floor are of simple rectangular design. Those on the second floor are paired six-light casements within an elaborate terra cotta molding that continues up around the arched window/door openings of the third floor. The arches of those openings are incorporated into the terra cotta frieze that elegantly finishes the top of the wall directly below the cornice. Visible portions of the roof are hipped, covered with decorative tile. Hidden portions of the roof are flat and finished with built-up roofing material, with the exception of the large skylights constructed of metal frames and wire glass. The first floor contains the lobby, complete with terra cotta fountains, stained glass clerestory windows, and ceramic tile flooring. In the vicinity of the lobby desk are a check room, attendant dispatch room, and elevators. The north and central portions of the building house the men's facilities: cooling room, pack room, steam room, hydrotherapy room, and bath hall. The women's facilities, considerably smaller in size, are at the south end of the building. Although the men's and women's bath halls both have stained glass windows in aquatic motifs, the most impressive stained glass is the massive skylight in the men's area, with the DeSoto fountain centered on the floor directly below it. The second floor contains cooling rooms, dressing rooms, and courtyards. The third floor houses a massive ceramic-tiled therapeutic tub, areas for men' s and women' s parlors, and a wood panelled gymnasium to the rear. The most impressive space on the third floor is the assembly room (now museum) where the segmentally arched vaults of the ceiling are filled in with arched, stained glass skylights. Arched wood frame doors surrounded by fanlights and sidelights open out to the small balconies of the front elevation. The basement houses various mechanical equipment, a bowling alley (since removed), and the Fordyce spring--a glazed tile room with an arched ceiling and a plate glass window covering over the natural hot spring. The interior of the building was remodelled between 1930 and 1940 to accommodate the installation of the Hubbard therapeutic tub. Between 1973 and 1984 the interior was extensively replastered, a new roof and flashing were installed, and much of the stained glass was restored. The Quapaw was completed in 1922 and is a Spanish Colonial Revival style building of masonry and reinforced concrete finished with stucco. The most impressive exterior feature is the large central dome covered with brilliantly colored tiles and capped with a small copper cupola. The dome's mosaic is chevron-patterned with a band of rectangular and diamond patterns encircling its base. The dome rests on an octagonal base. Most of the building is a one-story structure, with the narrow second story running the length of the facade and topped with the dome. The first floor is U-shaped in plan, and the second floor is rectangular. On the front elevation a series of arched windows is interrupted by a central pavilion that forms the entrance. The arched entrance doorway is flanked by two smaller arches. Directly above the entrance is a cartouche with a carved Indian head set into the decorative double-curved parapet. The Indian motif, found in several other places in the bathhouse, was used to reinforce the promotional "Legend of the Quapaw Baths" which claimed that the Indians had discovered the magical healing powers of the cave and spring now housed in the building's basement. The double-curved parapets at the north and south ends of the building are capped with scalloped shells that frame spiny sculpin fish. The shell and the fish both emphasize the aquatic aspect of the building. The scalloped shell is a common architectural element found in Spanish Colonial and Revival buildings. Originally the symbol was used to represent Santiago de Campostela, patron saint of Spain, but it evolved into a mere decorative element in secular revival buildings such as this. The sculpins, originally painted gold, are now painted white. Further emphasizing the entrance are two massive finials that project out of the roofline of the second story, visually framing the dome behind them. The sloped roofs of the first and second floor, visible from the front elevation, are covered with red clay tiles. Portions of the roof that are not visible from the ground are flat and finished with built-up roofing material. The interior of the building contains more than 20,000 square feet. The first floor has bathing facilities for men and women in addition to the lobby and sun porch, and the second floor has dressing rooms and a common writing room. The Quapaw was the moderately priced bathhouse with none of the extras such as beauty parlors. Baths, vapors, showers, and cooling rooms were provided. The partial basement contains laundry and mechanical equipment and a tufa chamber housing the Quapaw spring. Ramps were added to the front entrance in 1923. In 1928 the portico across the front of the building was winterized with glass enclosures in the window openings. Acoustical tile ceilings were added in the men's first cooling room and the women's pack room. Some of the outside walls were insulated the following year. New partitions were installed in 1944 to allow more space for massage facilities, and the laundry was put in the basement in the late 1940s. The display spring in the basement was covered with plate glass in the mid-1950s. In 1968, the building's emphasis changed from individual bathing facilities to hydrotherapy and physical therapy for about two years. The exterior was sandblasted, repaired, and painted in 1976. The building's use as a bathhouse ended in 1984 when the last contract ended. The Ozark Bathhouse was completed in 1922 and designed by George Mann and Eugene John Stern of Little Rock. The Spanish Colonial Revival building is constructed of brick and concrete masonry finished with stucco. The building is trapezoidal in plan, although the front elevation is symmetrical. The two-story building contains 37 rooms and approximately 14,000 square feet. The impressive front elevation has twin towers with three-tier set-backs from the main entrance which they flank. The main entrance to the building is through an enclosed sun porch, a later addition set between two pavilions that form the visual bases of the towers above them. The windows of the pavilions have decorative cartouches above them, as well as a series of rectangular set-backs that evoke a vaguely Art Deco feeling. Additional wings of the building continue to the north and south of the towers. The sloped roofs over the porch and part of the second story and the hipped roofs of the towers are covered with red clay tile. The tower roofs are topped with finials. The remainder of the roof is flat and finished with built-up roofing material, with the exception of the metal-framed glass skylight over the porch. On the interior, the central lobby has a marble counter with hallways to the men's and women's facilities on either side. Mirrors cover the walls in the lobby. The floor of the sun porch is covered with quarry tile, and most of the remaining floors in the building are finished with acrylic tile. Ceilings are concrete and painted plaster. Interior walls are brick and hollow tile finished with plaster. In 1928 concrete cooling tanks (finished with stucco on the exterior) were added to the rear of the building. Massage rooms were expanded in 1941. Cooling towers were removed in 1953. The interior of the second story was overhauled in 1956. The building closed for use as a bathhouse in 1977. Skylights were rehabilitated in 1983. The Buckstaff Bathhouse was completed in 1912 and is a simply designed, elegant Neo-Classical Revival building. Exterior walls are cream-colored brick, with white stucco finishes at the base, spandrels, friezes, cornices, and parapet. Engaged columns divide the entrance into seven bays, flanked by pavilions at the north and south ends. Friezes above the two-story doric columns have medallions (paterae) that frame the brass lettered words "BUCKSTAFF BATHS" centered above the entrance. Brass handrails border the ramp that leads up to the brass-covered and glazed wood frame entrance doors. First floor windows are arched; second story windows are rectangular. Those on the third floor are small rectangular windows, with classical urns between them above the cornice that finishes the columns. The first floor of the building contains the lobby and men's facilities. Women's facilities are on the second floor. The third floor is a common space containing reading and writing rooms and access to the roof-top sun porches at the north and south ends of the building. Access to the partial basement is from the exterior on both the north and south sides of the building. The basement houses mechanical equipment. The Buckstaff is the only bathhouse on the Row that remains in use as a bathhouse. The Lamar Bathhouse was completed in 1923 in a transitional style often used in clean-lined commercial buildings of the time that were still not totally devoid of elements left over from various classical revivals: symmetry, cornices, and vague pediments articulating the front entrance. The building is a two-star y reinforced concrete structure finished with stucco on the exterior. A one-story enclosed sun porch spans nearly the entire length of the front elevation. The two-story portion is rectangular in plan. The sun porch leads into the lobby, whose north, south, and east walls are covered with murals of architectural and country scenes. Facilities including cool rooms, pack rooms and bath halls are on this floor, with the men s at the north and the women's at the south. Centered in the building is the stair core that receives natural light from a skylight above. The second floor contains massage rooms, a writing room, dressing rooms, and a gymnasium. The flat roof is finished with built-up roofing material, with the exception of the metal-framed wire glass skylight. Brick and clay tiles cap the parapet edges. The partial basement houses attendant rooms and mechanical equipment. The building's bathhouse operations ended in November 1985. Finishing the southern corner is the National Park Service Visitor Center/Administration building. Constructed in 1936, this Spanish Colonial Revival building was designed by architects of the Eastern Division, Branch of Plans and Design, of the National Park Service. The well-detailed building has a simplified Spanish Baroque doorway framed by pilasters topped with frieze, cornice, and finials flanking a second story window. The window has rusticated moldings at its sides and is in turn capped with a broken arched pediment. Windows on the first floor are screened by wrought iron grilles. Openings on the second story are five-light french doors that open on to wrought iron balconies. The hip roof is covered with clay tile. The air-conditioning system was replaced in 1960. The first floor was remodelled in 1966 to accommodate a lobby and an audio-visual room. Steps up to the front door were enlarged in 1965, and the hand railing may have been put in at that time. The building is in excellent condition and remains in use as the primary visitor center and administrative core of the park. Other outdoor features are within the historic district boundaries. The Grand Promenade runs in a north-south direction on the hillside behind the bathhouses, between Reserve Avenue and Fountain Street. Construction on the Promenade began in the 1930s. By the beginning of World War II the Promenade was a graded pathway covered with gravel. After many false starts (planning and funding problems), the promenade was finally completed in the early 1960s. The paving brick was replaced in 1984. Fountains for public use have been located in the vicinity practically since the area was developed. Several remain today. The fountain directly in front of the stairway into the administration building is of cast concrete and was built in 1936. A new jug fountain on sidewalk in front of administration building was installed in 1966. The Noble fountain at the Reserve Avenue end of the Promenade moved to this location in 1957. The Maurice Spring fountain and retaining wall just north of the Maurice Bathhouse was completed in 1903. The original main entrance to the Reservation was between the Maurice and Fordyce Bathhouses directly below the Stevens Balustrade, at about the center of Bathhouse Row. The two bronze federal eagles on their stone pillars still stand guard over the old entrance, forming a gateway to the concrete path that leads between the two bathhouses up to the baroque double staircase of the balustrade. Below the eagles are the names of Secretaries of the Interior Hoke Smith (1893-96) and John Noble (1889-93) and "U.S. Hot Springs Reservation." The balustrade itself is of limestone ashlar masonry and concrete construction. The central bay houses a vaulted hemicycle niche containing a drinking fountain. The upper portion of the balustrade leads to the Promenade. A bandstand was located along the top of the balustrade on the Promenade, but it was removed because of its deteriorated condition in 1958. By the early 1970s, curbs and paving at the old main entrance constructed in the 1890s had been changed. Holly trees were planted to border the entryway. The areas around the bases of the stone pillars, originally paved, were grass-covered by that time. Several other entrances were located at various points along the linear development of Bathhouse Row during the 1890s, but they have disappeared over the years as a result of newer construction. None were as elaborate as the Main Entrance which still gives a sense of "high style" to Bathhouse Row. Army engineer Stevens was also responsible for establishing the Magnolia Promenade in front of the bathhouses. The Promenade had double rows of magnolias during the 1890s, but now a single row separates the sidewalk and the street. The varied architectural styles of the Bathhouses are pulled together by the linear greenbelts of the Magnolia Promenade and the Grand Promenade, and by the plantings of smaller hedges and bushes that soften the edges of the spaces between the buildings. Bathhouse Row is the largest collection of twentieth century bathhouses remaining in the United States, and it represents the high point of that industry when it reached its peak from the 1920s through the 1940s. Bathhouse Row is also one of the few collections of historic bathhouse remaining in the United States. As an entity, Bathhouse Row represents an area unique to the National Park System -- an area where the natural resources historically have been harnessed and used rather than preserved in their natural state. On a regional level of significance, the bathhouses also form the architectural core of downtown Hot Springs, Arkansas. The bathhouses represent a fine collection of varied eclectic architectural styles popular during the 'teens and twenties. Archeological evidence has proven that the hot springs which later supplied the water for Bathhouse Row were used prehistorically for thousands of years. In local Indian mythology, the valley of the hot springs was considered neutral ground, a healing place, and the sacred territory of the Great Spirit. Close to the springs is a novaculite quarry that was used prehistorically as a source for material for tools, weapons, and household goods. Hernando de Soto may have visited the hot springs in 1541 in his quest for gold, silver, and jewels. By 1807 the first permanent white settler was living in the area, and shortly thereafter a number of log cabins had been built in the vicinity. By the mid-nineteenth century the bathing industry in the United States, following elegant European precedents, was establishing more complex bathing rituals. The architecture began to reflect changes toward more formal stylistic tastes. Although the area had been set aside as the first federal reservation in 1832, government acquisition of the lands did not take place until 1879. By that time private development had established its own north/south linear building pattern along the creek and seeping hot springs. In 1884 the creek which ran in front of the bathhouses of that time was covered over with a stone arch which eliminated the separate bridges to each bathhouse. The arch also improved sanitation in the area. The space above the arch was filled with dirt and planted, so that each bathhouse now had its own garden space. From 1892 until 1900 the Department of the Interior undertook a massive beautification project to improve the character of the "National Health Resort." The main landscape thrust of the program was to provide formal gardens in front of the bathhouses, and more "natural," tastefully landscaped areas behind. The range of landscaping thus would provide areas for restful walks with enough connection with nature and the outdoors to ensure a healthy atmosphere for recuperation. Frederick Law Olmsted's landscape architectural firm was hired to produce plans for the area, but those plans were rejected or left unfinished for a variety of reasons. The project development was then given to Lieutenant Robert Stevens, an Army engineer. Stevens designed the entrances to the reservation, including the historic main entrance. He also conceived of the Magnolia Promenade in front of the bathhouses, the meandering upper terrace behind the bathhouses, and a series of pathways, carriage roads, and vest-pocket parks. By 1900 the Hot Springs Reservation landscape had both the informal Victorian landscape design and the more formal post-1880s design. By that time a series of bathhouses had been constructed, and through the early decades of the 20th century the parade of buildings continued. At first wooden bathhouses were constructed and then replaced after fires or deterioration made them unsafe. Architects began choosing materials less prone to deterioration and fire. The changes to all of the bathhouses over time reflected changes in the bathing industry, changes in technology, and changes in social mores. By the turn of the century Hot Springs became an attraction for fashionable people all over the world to visit and partake of the baths, while maintaining its reputation as a healing place for the sickly. A few other key points in the history of Bathhouse Row affected the natural and architectural landscape, resulting in what remains today. In 1916 Stephen Mather, director of the National Park Service, brought landscape architect Jens Jensen down from Chicago to enhance Bathhouse Row. Under his direction lights were placed along the street promenade and various flower gardens were cultivated in front of the bathhouses. George Mann and Eugene John Stern of Little Rock were hired in 1917 to do a comprehensive plan of Bathhouse Row to guide its future development. In their view a Spanish/Mediterranean Revival architectural theme was appropriate for the "Great American Spa." The intervention of World War I stopped their grand plans, although their design of several bathhouses and review of other bathhouse plans had a strong influence on the architectural character of Bathhouse Row. In the 1930s the design of a new hot water system for the bathhouses resulted in changes to curbs, plantings, and gutters along the Magnolia Promenade. The more formally aligned Grand Promenade at the rear of the bathhouses (begun in the 1930s and completed in the 1960s) replaced the meandering Victorian path and changed the architectural character of area. The Hale was probably the first of the Hot Springs nineteenth century bathhouses to offer modern conveniences to its bathers, and thus became more cosmopolitan in nature. The first Hale Bathhouse, built in the 1840s, was the first bathhouse to provide more than just a bath as a service. The present Hale Bathhouse, the third building on that site with that name, continued that tradition. The building retains a considerable amount of its nineteenth century character, and probably has extensive historical archeological potential around its foundation. The Quapaw Bathhouse was built on the sites of two earlier bathhouses which resulted in its large land assignment on Bathhouse Row. The moderately priced bathhouse services were designed to serve the masses. The building also was designed with accessibility for chairbound persons in mind. The natural hot spring in the building's basement was publicized in promotional brochures making the cave and hot spring a popular attraction. The Ozark Bathhouse catered to a middle class clientele and, like the Quapaw, had bathing facilities on its first floor making them accessible to the elderly and handicapped. The Maurice and Fordyce Bathhouses were strategically located at the north and south sides of the historic entrance to the Reservation. Both of these buildings provided bathing experiences for the wealthy. The elegant interiors and quality service attracted an upper class clientele. The placement of the two most architecturally significant structures at the main entrance set the refined architectural character of Bathhouse Row. Both were luxurious in design and appointments and were equipped with the most sophisticated bathing facilities. The Maurice and Fordyce also offered additional attractions. The Fordyce catered to more than the client's physical needs by providing diversions such as a museum displaying prehistoric artifacts, roof gardens, a bowling alley, and a gymnasium. The Maurice had its Roycroft Den or Dutch Den that served as a gathering place for well-to-do clients. All of the buildings on Bathhouse Row have certain architectural elements in common that contribute to the district's unity. All of the buildings are set back the same distance from the sidewalk, and have garden areas and green spaces in front. They are all of similar height, scale, and proportions. The sidewalk and remaining Magnolia Promenade to the west and Grand Promenade to the east tie the buildings together. What makes that unity successful rather than boring in an architectural sense is the diversity that exists within it. The eclectic combination of styles and materials provides texture and visual interest to the group. The free use of Greek, Roman, Spanish, and Italian architectural idioms emphasize the high style sought after by the planners and Create a strong sense of place. What remains on Bathhouse Row are the architectural remnants of a bygone era when bathing was considered an elegant pastime for the rich and famous and a path to well-being for those with various ailments. Today only the Buckstaff provides baths and related services. Throughout the country, nineteenth century bathing rituals have been replaced by late twentieth century health spas that emphasize physical fitness and diet, and that sometimes provide bathing as part of the regimen. The bath is no longer the central feature of rejuvenation provided by spas in the United States. Advances in medicine and the high costs of medical care have diminished the importance of bathing in physical therapy. The need for bathhouses on the scale of Bathhouse Row no longer exists. The 150 year tradition of. providing bathing services has evolved to near extinction and hopefully the future will hold the key for continued operation of the buildings in related industries. Cromwell, Neyland, Truemper, Millett & Gatchell, Inc. Historic Structure Report, Hot Springs National Park, Arkansas. Santa Fe: National Park Service, 1973. Pitts & Associated Engineers, P.A., and Witsell and Evans, Architects-Planners. Interim Report Phase Two Testing On Site, Investigative Study of five Bathhouses, Hot Springs National Park, Arkansas. Santa Fe: National Park Service, 1984. Rhodes, Diane. Historic Grounds and Structures: An Interim Report on Bathhouse Row, Hot Springs National Park, Arkansas. Denver: National Park Service, Denver Service Center, 1985. United States Department of the Interior, National Park Service. Bathhouse Row Adaptive Use Program Technical Reports 1-7. Arkansas, Hot Springs National Park, 1985. The boundary is shown as the dotted line marked "HISTORIC DISTRICT BOUNDARY" on the enclosed Historic Building Survey Map (omitted from on-line edition).